Day 120. 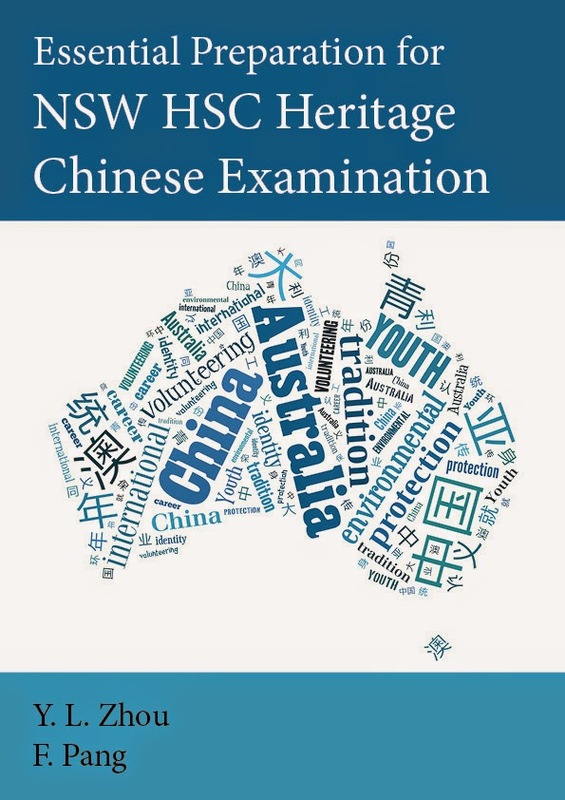 My colleague and friend Faraday teaches Chinese at my school, and has co-authored a book for teaching HSC level Chinese. It's full of resources and practise exercises and although I don't understand a word of Chinese - well, maybe Ni Hao (hello) and Xièxiè (thank you), so I guess two words - it certainly looks like a useful resource for teachers who teach Chinese. When she showed me the cover design, just made in Word, I thought it could do with a bit of colour, so I offered to make something just a little nicer in InDesign. It's only simple, but here is the first revision of the cover as a daily create. Day 119. 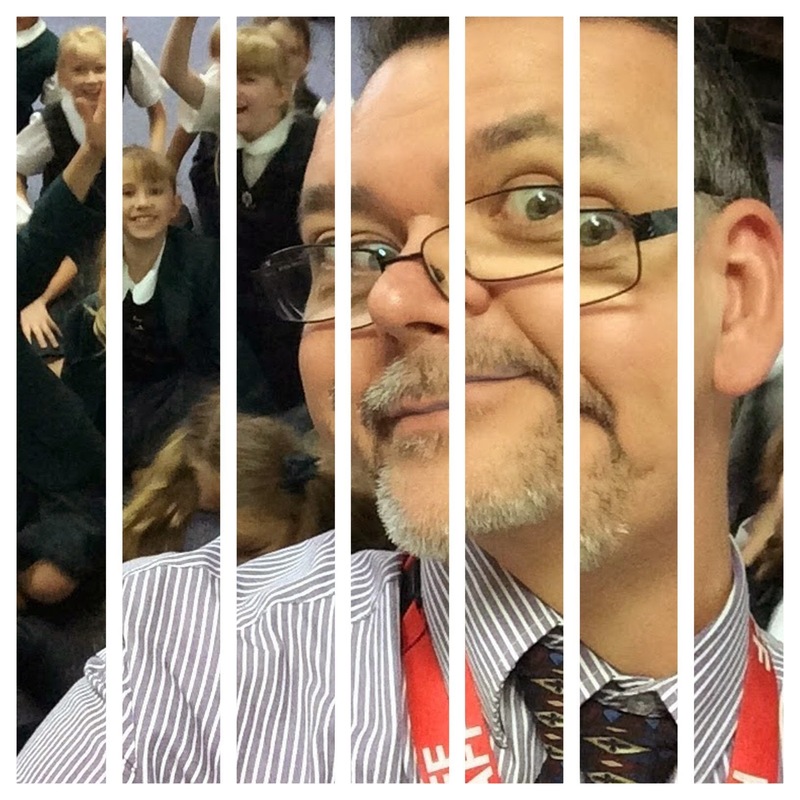 I was showing my Year 3 kids how to use Gmail and they wanted to know how to add a profile photo. So I showed them by taking a selfie. To make it a bit more interesting I dropped it into a grid on Diptic and shattered it around a bit. Day 118: Yesterday afternoon we went for a drive up to Manly with a friend visiting from California. Although it wasn't the nicest weather for a beach visit, it provided a chance to make this Photosphere image using my Nexus 5. 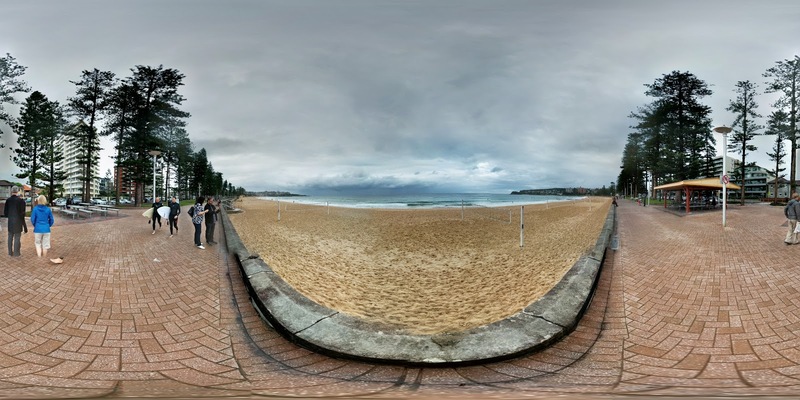 This is actually a full 360 degree photo panorama, although it doesn't show here on Blogger. However, if you click the image itself and you will be taken to the full thing on Google+. Day 117. PlayArt is a fun little iPad app that let's you create artworks based on appropriating and rearranging bits and pieces from famous artworks to create new compositions. Here's one that would make Modigliani turn in his grave. Day 116. Using an iPad app called Foldify, I made this cube net with some photos of various moods. Maybe it could be used to decide a random reaction, or start a random conversation based on the mood. Either way, a bit of fun, and today's create. Day 115. For some reason I always seem to find myself playing with GarageBand on international flights. Not sure why. Anyway, today was no exception, and I composed this little 24-bar riff while flying across the Tasman from Christchurch to Sydney. I don't claim it's perfect, it's just an idea. I do think though, that getting students to use Garageband to come up with simple riff-style compositions, even just bass and drums to get a good groove happening, is a great way to get them started with GB. Start with a drum track, add some bass, then keep layering in more sounds. I want to do that activity with my Year 5 kids this term. Day 114. While staying in the hotel in Christchurch I noticed the bathroom had one of those old style round magnifying shaving mirrors on the extendable arm. (I've only ever seen them in hotels...). It inspired me to take a few "stubble selfies" in the mirror, which I then assembled into this image using Diptic. Day 113. I'm at the Google Summit in Christchurch today and I sat in on Wes Warner's session about editing video with Chromebooks. Although Wes spent most of the time using the YouTube Editor, I messed about with WeVideo, a cloud based video editing tool that works in the browser. I shot this footage on my Nexus 5, uploaded directly to WeVideo from the phone, then logged in on my computer to edit the footage. It's only a quick and simple example, but it shows what sort of video editing can be done in a browser. Day 112. This fine piece of silliness was made using an iPad app called Morfo. It captures an image of your face, then allows you to map out the main features in order to animate it. Obviously it comes with a bunch of silly costumes, but the potential in the classroom is pretty interesting. This was uploaded using the YouTube Capture app, with music added from the YouTube open music library. Day 111. For today's daily create I used an iPad app called TypeDrawing. It enables you to take a piece of text and load it as the "paint", so that dragging your finger then draws with the words. I found this piece of text on the National Geographic website that talked about ant mills, and so I tried to make a visual connection with the text and the image. The text was drawn with TypeDrawing, then imported into Adobe Photoshop Touch, where a png file of an ant, (with a transparent background) was added to complete the story. Day 110. Today's create is this delicious looking apple pie. No following a recipe today, just following my nose, so to speak. Apples, butter, brown sugar, cinnamon, cloves. 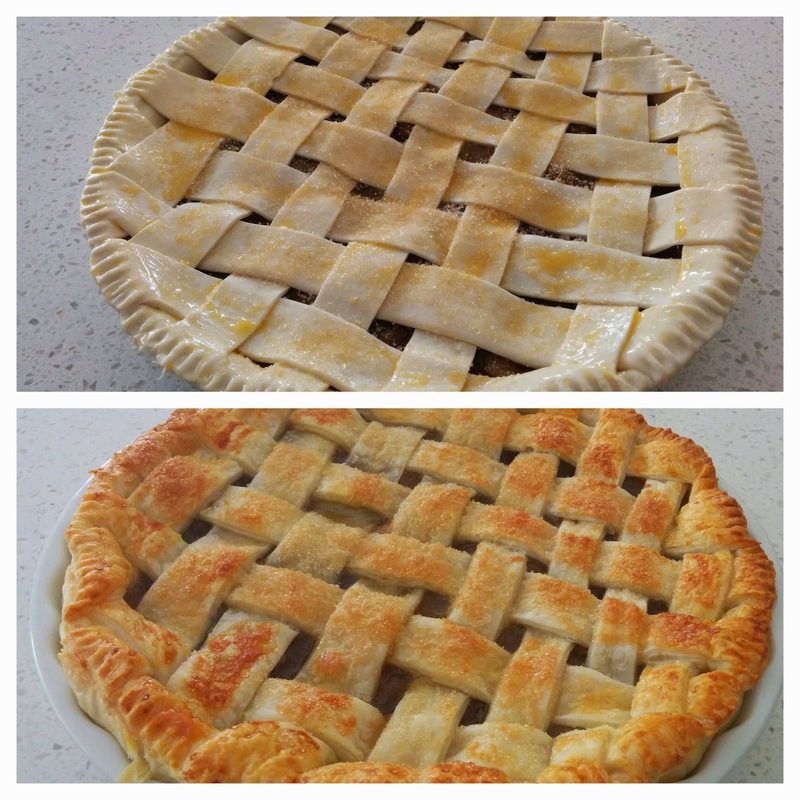 This is my first attempt as a lattice crust, had to look on YouTube to see how to do that. These two shots are before and after going into the oven. Looks pretty yummy to me! Day 109. I did my first skydive this morning and couldn't help but buy the overpriced video package they sell with it. Of course I wanted to put it on YouTube, but they had copyright music with it (how do they get away with that? I guess they must pay royalties) Anyway, I ripped the DVD, re-edited the clip using Adobe Premiere Pro, added some Creative Commons music, a few new titles, and re-rendered the whole thing. Thanks to my mum who gave me the jump as a birthday gift last year, and to Linda who came along for moral support this morning. Would I do it again? You bet. Day 108. While playing around with Diptic tonight I discovered it has a mode that will fill the frames with images selected at random from the iPad camera roll. So here, with zero intervention or aesthetic consideration from me, is six images selected at random by the machine. 1. Sunset on Cronulla Beach, doing steel wool photography. 3. Sir Ken Robinson and I at ISTE in San Diego. 4. RAAF banner from the ANZAC Day march in Sydney. 5. A Zorb ball at the PLC Sydney Open Day last year. 6. My mum and I at home. Day 107. Yesterday was the final day of the Sydney Google in Education Summit held at PLC Sydney, where I happen to work. Although I could probably claim the Summit itself as an act of creation, I was just a small part of a much larger team that made it happen, so they deserve far more of the credit for it. However, I was given the honor of delivering the closing keynote for the event, so I tried to wrap the talk into five main ideas each supported with some stories and examples. Some I've used before, and some were new, but I hope that they were meaningful in some way to somebody. Day 106. Using an iPad app called iFontmaker you can turn your own handwriting into a font. I've done this before as a daily create, but after 100+ days now I might look at refining some of the things I've already done so far. That doesn't mean I want to repeat myself, it just means I may try to build on the idea previously used. So here is a font I made tonight, which I've called Chris' Hand. You can visit this website to download it and install it on your own computer. If you end up using it, let me know! Day 105. Today was the first day of the Sydney Google in Education Summit, hosted at the school where I work. I was running around from very early to very late. When does one find the time to create something when one is busy doing things all day...? Day 104. I'm sure that nobody really sets out to fail, but we definitely need to build more tolerance to failure onto our daily lives. Day 103. I have some exciting news to tell. Soon. For now, suffice to say I've started a company for doing some things that I'm really excited about in the very near future. It's name is Crux Learning. For today's daily create I used Adobe Illustrator to design a logo for this new company. Here it is. The name Crux has a few meanings, and I tried to design the logo to capture some of them. You've probably heard the expression "Getting to the crux of the issue". It's means getting to the heart of things, tapping into the most important points at issue. Not dancing around the edges, but focusing on what actually makes a difference. Crux is also the name for the constellation that adorns the Australian flag, otherwise known as the Southern Cross. In fact, Crux is the latin word for cross. Day 102. I completely forgot where I found this quote, but I remember really liking it at the time so I recorded myself reading it. I then forgot all about it, and only just found it. I think it has great wisdom in it. Day 101. Next week my school plays host to the Sydney Google in Education Summit, and we have a whole bunch of teacher coming to visit. Although it's holiday time, I thought it would be nice to get the students to welcome out visitors and tell them a little about how we use Google Apps at PLC, so I put together this very short welcome video. Day 100. 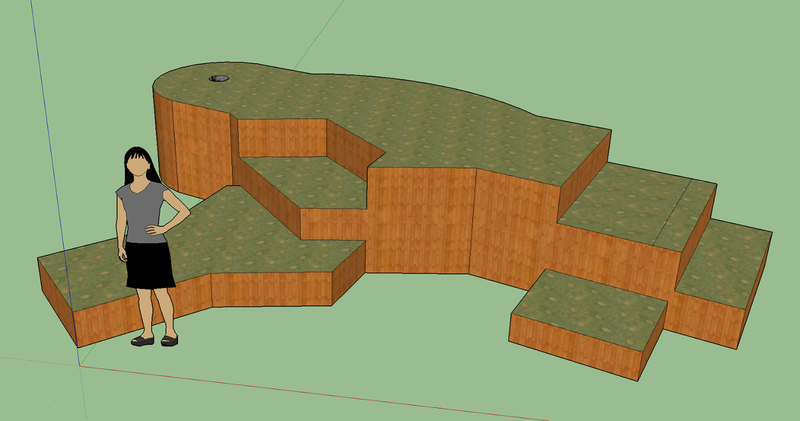 I was just messing around in Sketchup Pro and made this doodle, a sort of stage/walkway/minigolf object. No idea really what it's supposed to be, but it used a few extrusion and curving techniques in Sketchup. Sketchup used to be owned by Google and free, but they sold it to Trimble and now the full version costs about $700. It's still free for educators but you have to write to them with proof of your teacher status in order to get a licence code. Day 99. This little maths problem is something that has puzzled me for a while now, but I've never really gotten an answer to it that I felt satisfied with. So today I happened to to find a really good maths forum on the StackOverflow site that lets you ask a maths question and get answers from some very smart sounding people. So I put this little video together to help make my question clear. The images were made using Google Maps and Google Slides, then captured using Camtasia Studio. Do you know the answer? Can you explain it clearly? Feel free to suggest your ideas in the comments below. Day 98. 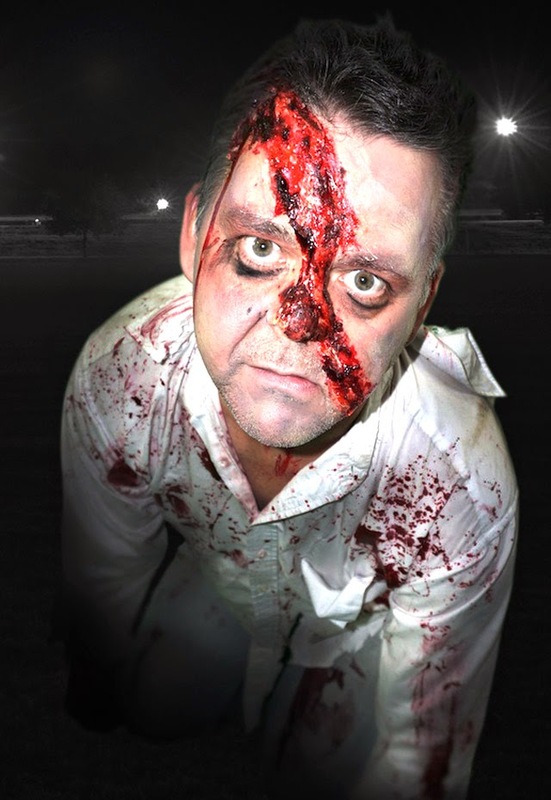 We had a team building day at work a while ago where, with the help of a professional makeup artist, we made ourselves up as zombies. A bunch of photos were taken on the day against a green screen but I never really did anything with them. For today's create I decided to dig one of them up (see what I did there?) and mess about with in Photoshop CC, adding a background and fiddling with the shading and colours. Handsome, huh? Day 97. I'm a bit out of practice when it comes to drawing, but I thought I'd give it a go. Using a Jot Adonit stylus and a copy of 53's amazing app called Paper, I had a go at drawing Steve Jobs from the cover of the Walter Isaacson biography. It's not a great likeness, but if you're familiar with the book I'm sure you'd recognise it as Steve. I actually used the upside-down drawing technique, as described by Betty Edwards in the book Drawing on the Right Side of the Brain. Still a great read even though it's many years old now. If you're into art and drawing, it's worth a read. Day 96. I sometimes use this fun little Photoshop activity with my students so I thought I'd use it myself for a daily create. 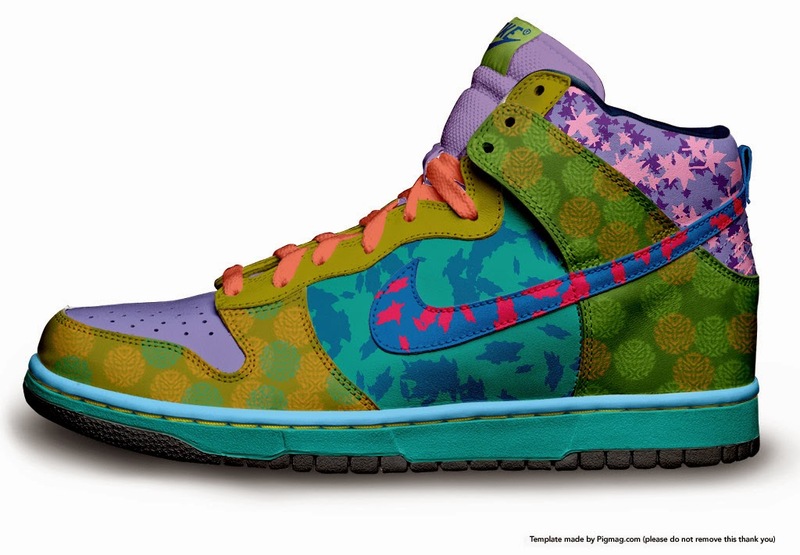 Using some Photoshop PSD files from www.pigmag.com, you can download images of sports shoes (and other things too) that have the various parts of the object split into layers, making it very easy to play around with colour schemes. Just use the brushes tools in Photoshop to paint, daub, smear, swipe, on the correct layer and you can get all creative with your design. Day 95. Google voice search is pretty amazing. Not only can it actually understand the sound of your voice to convert it to words - often no mean feat in itself - it can also then return answers to your questions in mere milliseconds. For today's create I asked Google Search 50 questions using nothing but voice. The speed and accuracy of the answers are pretty stunning, and a great example of why we need to be asking our students to be doing much more than simply recalling facts. Day 94. This little animation was made using an Android App called GIF Camera. Very simple to use. I quite literally learned how to use it in the blink of an eye. Day 93. I've played with 123D Catch and 123D Creature before, but this was made using 123D Sculpt. Basically you start with a lump of "virtual plasticine" and then push it, pull it, extrude it, sharpen it, etc. This weird looking head started as a sphere, but was slowly modelled into this shape, then painted and patterned. I've been really very impressed with these 123D apps from AutoDesk. I probably need to spend a bit more time with them so that what I make doesn't look quite so bizarre, but I think they could do some very cool things. Day 92. A couple of years ago I bought a SYM VS150 scooter and I really enjoy scooting around on it. It's a great way to commute, especially with the free parking that motorbikes get in the city of Sydney. 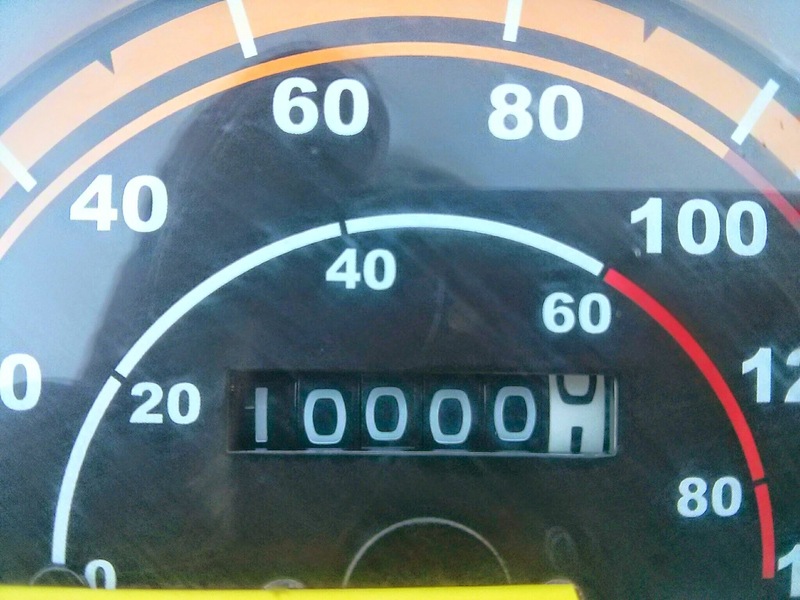 Today it ticked over to 10,000km. Not bad for a little 150cc scoot. As I took a photo of the speedo as it hit this milestone mileage (don't worry, I pulled over to take the photo!) it dawned on me that owning a bike has helped me create a few things. In the last 2 years I've created less traffic congestion, less pollution, and less CO2. I've created less demand for fuel and oil, less demand on natural resources, and less demand for parking. It may not be much, but it's a create I feel pretty good about. Day 91. One of our English teachers at school asked if I knew of an easy way to visualise characters. Her students were reading a novel and she wanted them to create drawings of how the characters looked in their heads. My first thought was to use a police identikit to construct the faces. A quick search turned up FlashFace at http://flashface.ctapt.de/. It also has an app for both iOS and Android. The web version is pretty good and does quite a lot, but the free version on Android is a bit limited, and only does male faces. Still, it's worth a look and it made the English teacher very happy.